Last week, a few of us from Walker HQ were lucky enough to get tickets to see I Want My Hat Back on stage at the National Theatre. We were all VERY excited and intrigued to see how the picture book that we all know and love would be transformed into an hour long show! So the verdict? We all loved the show! The performance was packed with great music by Arthur Darvill, quirky and creative costumes and lots of surprises (which we won't spoil for you). We quickly lost count of how many times we laughed out loud - and we weren't alone; the audience was packed with captivated kids who were all giggling, clapping, pointing and yelling "he's behind you!" We were all impressed with how the play remained true to the book, from the beautiful, muted colour palette to the quirks and mannerisms of the characters. Added touches like the retro, homespun set and a soundtrack that flicked effortlessly from cool jazz to head-bopping rock kept the parents as entertained as their children. I Want My Hat Back is a treat for everyone aged 3 – 300, and we think it's the perfect Christmas show for all the family. It's on until 2 January but we hear from our friends at the National Theatre that the tickets are selling out fast, so don't miss out! You can book yours here. 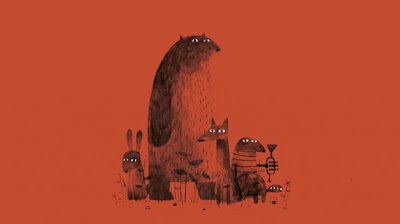 You can buy a copy of the book (and all Jon Klassen's books) in the National Theatre bookshop. Check out the brilliant reviews the show has had in The Guardian and Time Out. Who wrote the music for the National Theatre's play of I Want My Hat Back? To enter the competition, just email your answer to competitions@walker.co.uk along with your name and address before 30th November. 1. This prize draw is promoted by Walker Books Ltd. incorporated in England under registered number 1378601 (the “Promoter”) and is not open to employees of the Promoter or their families. 2. Entrants must be residents of the United Kingdom or Republic of Ireland. 3. There will be 1 prize winner and 5 runners up, who will receive the prizes stated. All prizes are non- transferable and there is no cash alternative. 4. The closing date is 30th November 2015. 5. Winners will be notified by 10th December 2015. 6. Only prize claims received on or before the closing date will be honoured; the Promoter accepts no responsibility for claims received after the Closing Date. 7. The Promoter accepts no responsibility for any entries that are late, lost, damaged, illegible or corrupted in transit. Proof of entering is not proof of receipt. 8. The Promoter’s decision is final and no correspondence will be entered into. 9. Any personal data obtained and/or gathered by the Promoter shall be used only for the purposes of the competition. All personal details shall be held in accordance with the Data Protection Act 1998. 10. Only one entry will be accepted per email address used. 11. The first prize is five tickets (two adults and three children) to see I Want My Hat Back at the National Theatre. 10 runners up will receive a copy of the book, I Want My Hat Back. 12. There is no cash alternative. 13. The prize is not transferable. 14. Travel to The National Theatre is not provided. 15. The tickets are subject to availability and the National Theatre reserves the right to alter the prize if necessary. 16. The tickets must be used by 2 January 2016. 17. Tickets are valid for any performance until 2 January 2016, subject to availability. 18. The rules of this prize draw are governed by UK law and entry is conditional on acceptance of these terms and conditions which may be amended at any time by the Promoter.